The Warriors embarked on the 1968-69 campaign equipped with only one starter returning from the 23-6 club of the previous year. Aware of his team's lack of experience and anticipating a banner year for Midwest independents, perenniel pessimist Al McGuire warned Marquette fans against expecting better than a 16-10 record and against making the NCAA a topic of discussion. That returning starter was the one who counted: a 6-2 senior named George Thompson whose ruthless assault on the MU record book would give him dominion over virtually every offensive statistic in the school's archives. The leadership he would furnish for a strong, but untested, supporting cast gave most Marquette fans to expect a year of record success. 1968-69 was the season of promise, McGuire's dire predictions notwithstanding. McGuire's words echoed through the early season sounding more like prophecy than the wiles of a cagey psychologist. The Warriors split their first four games. But the second loss, to a well-respected Drake squad, may have marked a watershed point in the MU season. For two important truths had revealed themselves through that 2-2 record. Dean Meminger, the ballyhooed sophomore with a fistful of high school credentials was for real. And Ric Cobb, Ranger (Texas) Junior College's “Elevator Man” who had averaged 10 points and 10 rebounds subbing for Ron Rahn, deserved a starting position. 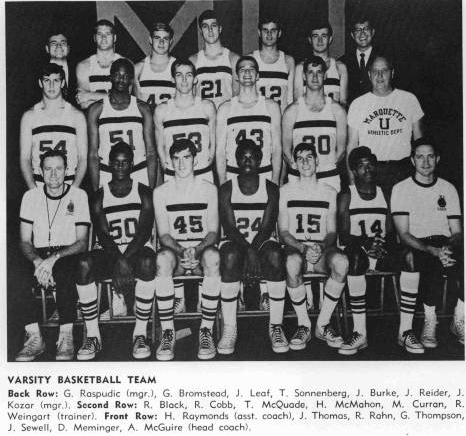 With its big four of Thompson, Thomas, Cobb and Meminger duly intact, Marquette now bounded away to eleven straight victories that included a Milwaukee Classic title, an upset of sixth-ranked Detroit, and a record 118 points against UW-Milwaukee on a school-record 48 field goals. The semester break winning streak came to an end in Madison as the Badgers gained revenge for their loss in the Classic with a 56-50 triumph, a game which saw Thompson score the 1,505th point of his career and overtake Don Kojis as the leading scorer in the history of Marquette basketball. The Warriors bounced back winning 9 of their last 10 regular season games. The 22 regular-season victories, which tied a record set by the 1955 contingent, were recognized with an at-large berth in the NCAA. In the sub-regional at Carbondale, IL, the Warriors vindicated their bid with a 82-62 rout of Murray State's dangerous Racers. In the Mideast regional at Madison, Al McGuire witnessed one of the finest hours of his coaching career when his rapacious troops upset Kentucky's 6th-ranked Wildcats, 81-74. The victory avenged last season's 107-89 funeral at Lexington's NCAA regional; and, more significant, sent the Warriors into the finals against Purdue. The Boilermaker tilt left Marquette only a few seconds, or, a single shot, away from its first trip to the national finals. The Warriors overcame an early 14-3 deficit to eventually send the game into overtime, then watched Rick Mount end it all with a jumper at the gun. Marquette finished the season ranked 14th in both the UPI and AP polls and ranked 12th nationally in scoring defense, allowing 63.5 points per game.